Last week I gave you an edifying review of my experience of adolescence in Canada (aka “the New World”). It does strike me on a regular basis that being a teenager is a very different experience, to use my Grandmother Baker’s terminology, in the “colonies” than in the “the old country”. French high school students, working long and hard hours towards their baccalaureate exam at the end of Grade 12 (called Terminale) would get home and be served a gourmet dinner by their parents as befits a serious academic. Philosophy, art, and literature are discussed and debated, and the french adolescent is expected to participate fully in adult conversation and is not allowed to retreat into “teenager world”. This is probably made easier by the fact that high school students here in France are viewed as an fledgling academics, and therefore their views are received with the consequent respect and gravitas they deserve. If there is a quality film playing in the local cinema or for rent at the video store this may be watched by the entire family after dinner. The french do not have the tradition of part time jobs during high school in contrast to their new world counterparts. This is because working towards the baccalaureate is widely considered to be their absolute top priority. Anything that distracts from this is looked on very negatively. I have also observed that us Immigrant Offspring are taught to put a higher importance on money than our old world counterparts. In France, learning to cook, entertain, and debate are considered much more important goals than learning how to work. I think this can go a little way in explaining why France is often caricatured as a country of lazy philosophers, and North America as a place of culture-deprived mercenaries. However, if the teenager is from a winemaking family, which many are around here, he / she will be expected to pitch in with work in the vineyards or in the cellar, but only after the commentaire compose for their philosophy class has been completed. In preparation for Saturday evening when the french teenager is celebrating their 17th Birthday with 30 or so of their friends and classmates, mother and grandmother are helping them prepare their village salle des fetes. This is a perfect opportunity for the older generation to pass down to the younger (i.e. teenage) generation what is known here in France as “l’art de recevoir“, meaning the art of entertaining friends and family in an elegant, competent and delectable manner. In France, and particularly in Burgundy, this is considered nothing short of an art form. This entry was posted in Uncategorized on May 30, 2008 by admin. The water meter guy came by yesterday to, not surprisingly, read our water meter. On the way back out from the nuclear bomb site that is our basement he paused by the shutter that Franck is in the middle of painting Indian blue. “What a great colour,” he said, admiringly. I didn’t even know Burgundy had a blue. I thought its colours were…well, Burgundy, with a bit of yellow thrown in for good measure. And here I was thinking I had chosen an exotic Indian blue, and that I would be introducing a strikingly original colour to my village. I should have known that all paths lead back to Burgundy. This entry was posted in Snapshots of French Life on May 30, 2008 by admin. I feel exactly like I did the time I was caught after siphoning off 3/4 of my Dad’s gin bottle and replacing it with water. Old World Adolescence will arrive on Monday! And in the meantime I will count my lucky stars that I didn’t spend my formative years in front of a computer screen but rather in the Great Outdoors. I’ve also added one of my favorite things in the world, a ClusterMap that shows all my visitors on the world map. Visit and see what you look like as a bright red dot! I’ll be posting the continuation of Adolescence in the New World versus the Old World tomorrow. Until then I have two very thirsty stonemasons here, a sick 6 year old, and a fractious baby…must fly. This entry was posted in Uncategorized on May 29, 2008 by admin. Emissaries who have braved liquor store cashiers arrive and are roundly cheered. Trunk full of alcohol is unloaded and orders are checked and passed out. Money changes hands. Someone always brings camera, so painfully self-conscious adolescent photos can be taken, although of course we tell parents plastic cups were just filled with apple juice. 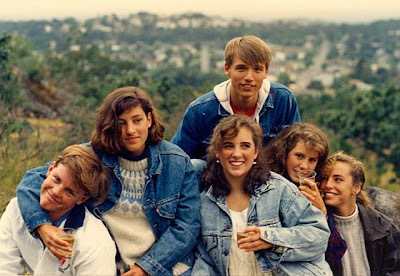 Sadly, must admit that I was still sober when I put on that acid-washed denim jacket I am wearing in the above photo and found it to be simply smashing. Perhaps because it highlighted my perm? 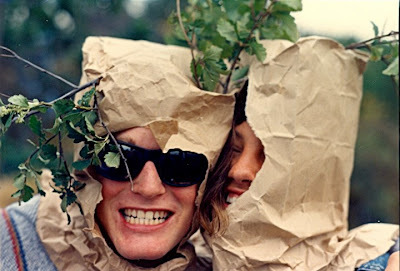 We entertain ourselves with the materials at hand. Us immigrant offspring have inherited those resourceful genes of our ancestors who found 1000 different uses for moose sinew. Freed from inhibitions thanks to the folks at the Molsons and / or Bacardi brewing companies some party goers would slink behind scrub for impromptu make-out sessions, which would be thoroughly dissected come Monday. Paddy wagon arrives on scene. Coppers make big show of threatening to charge us with underage drinking, and we all try to act sober and say “yes, sir“, “no sir” like we have been taught to at school. They take away all remaining alcohol before leaving. We shout many bold insults, the favorite being “have fun at the policeman’s ball!”, but only after we can no longer see paddy wagon’s tail lights in distance. Hop into car of designated drivers, wind our way back down the hill, and get dropped off at home. Eat about ten mint lifesavers before opening up the door so parents don’t smell alcohol on breath. This entry was posted in Uncategorized on May 28, 2008 by admin. 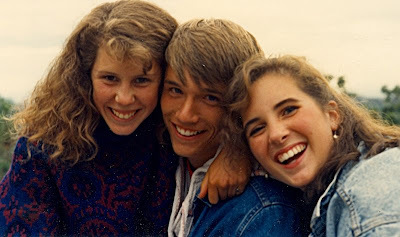 My sisters Suzanne and Jayne attended their 20th and 10th High School reunions last weekend. The highlight of my own 10th High School reunion in 2000 was when my former headmaster asked me when I was expecting my baby. I had given birth to Charlotte more than 2 months previously. Yes, the evening was that stellar. Luckily I still have 2 years to go before deciding whether or not to subject myself to my (gulp) 20th high school reunion, but in the meantime Suzanne sent me a link to some photos of our high school shenanigans and it got me thinking…being a teenager in Victoria, Canada was a very different kettle of fish from being a teenager here in Burgundy, France. Emissaries sent on a mission to the local liquor store. They are inevitably carded by the world-weary liquor store cashier. They are then forced to loiter outside looking for a down-on-their-luck person with flimsy morals who can be swayed with a few colourful Canadian bills to bootleg alcohol for us minors. Bootlegger found and sent into liquor store with massive order for 20 or so underage drinkers. 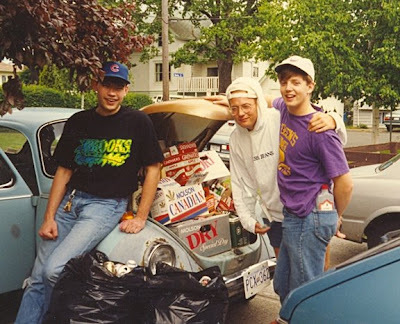 Emissaries gleefully fill up the trunk of one of their “beaters” with cheapest available beer for the guys and coolers for the gals in preparation for Saturday night. Get up late for the unemployed, get up early for the employed (i.e. me), go to work and sell clothes to Victoria’s doyennes of society all day long, get off work at 5:00pm, feeling ready to let off some steam. Get home, phone around to friends to see if anyone’s parents have either: a) gone on vacation and left house unattended, or b) are amazingly open-minded about rampant underage drinking going on under their noses. As answer is generally a resounding “no” to both, only option left is to fall back on the plethora of wilderness areas Canada provides its young’uns. 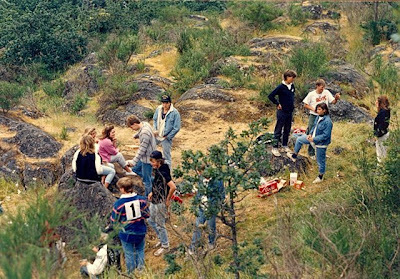 Unanimous decision to do what we do most weekends and consume alcohol on small wooded hill near high school known as “Mount Tolmie.” Party thus baptized a “Tolmie Party” in Victoria teenager parlance. Party attendees tell parents they are going to a friend’s house, then converge on mountain at pre-arranged time, killing time while waiting for emissaries to arrive with trunk full of alcoholic beverages. This entry was posted in Uncategorized on May 26, 2008 by admin. Non, I’m not two weeks late. Mother’s Day is actually on a different day here in France, and as I discovered while living in Oxford on an entirely different day in the UK as well. This makes me wonder if Mother’s Day was not in fact created by a man (perhaps Mr. Hallmark? ), because, really now, what mother needs to be even more confused than she already is? This morning I was woken up with a pile of construction paper wrapped presents from my girls. Among other gifts, I received a package of Kleenex (because I blow my nose a lot at night), several centimes coins that amounted to about one euro and twenty centimes that they have instructed me is to be used to take them for a ride on the Visiotrain tourist train in Beaune, a black hair elastic, a pen that yesterday had been sitting on my desk, an eraser, and one of my own business cards. I also received two “pense–bêtes” made at school to write down lists of things I might forget otherwise. Very timely, as this comprises of about 99.5% of things these days. From Clem I got a drooly lick on my cheek. Joyeuse Fête des Mères to all you fellow mothers out there! This entry was posted in Uncategorized on May 25, 2008 by admin. Here it is folks, my life-transforming Indian blue on the hinges and metal clips there. The window itself (the wooden parts) will be painted white eventually. So, qu’est-ce que vous en pensez? As soon as we get the first shutter up I’ll be sure to post a photo here. This entry was posted in Uncategorized on May 23, 2008 by admin. I have decided to begin a new series of posts called “Why I Love Burgundy”. Why I Love Burgundy – Reason #1: When you invite friends to a BBQ, they will sometimes bring along a 14 year old bottle of Grand Cru, Clos de la Roche for you. P.S. And oui those are our hideous brown-stained shutters behind the bottle that will soon be painted Indian blue, a change which I’m quite certain will transform my existence. This entry was posted in Why I Love Burgundy, Wine-Related Posts on May 22, 2008 by admin. The other evening the lovely couple the Kolchinskis from Calgary who were staying in La Maison de la Vieille Vigne came over for a glass (or two) of kir and brought us this box of chocolates from the wonderful Bouché chocolate and pastry shop in Beaune. We told Charlotte and Camille that the chocolates had alcohol in them (they didn’t) and were only for grown-ups. They were so good I don’t feel the slightest bit guilty. This utopia is just a block from Le Relais du Vieux Beaune so visitors are there are warned to visit with caution – you may just find yourselves going back several times a day. This entry was posted in Uncategorized on May 21, 2008 by admin.